Ask fellow campers about "Wild Cherry Resort" and nearby attractions. If you want quiet then this is the place. Immaculate grounds. Staff is super friendly. I had a family emergency and they couldn't have been nicer. They were able to accommodate are reservations and adjust. Newspaper delivered daily! WiFi excellent. We will be back!!! We camped at Wild Cherry Resort in a Fifth Wheel. Central to everything! Sleeping Bear Dunes right down the road. Wineries galore!!! Cute little towns close by. Maybe a 15-20 drive to Traverse City. We loved this park & will definitely be back again. We were parked by the water in a front in space & it was great. Lots of places to walk the dogs. Beautiful grass & a great view. No cable but no problem getting satellite. Trash pickup at site. It was nearby Traverse City & Suttons Bay. Lots of great restaurants & shopping. Plenty of sights to see. The staff was very friendly. We camped at Wild Cherry Resort in a Motorhome. Beautiful setting! On a previous golf club with lake. Owners outstanding and so friendly. We got a newspaper delivered to our picnic table everyday!! They picked up our trash everyday! Close to many, many wineries. Sutton Bay is two miles away...a quaint town on the lake. Close to Fishtown and To Sleepybear Dunes. We would have liked to stay longer...so nice and centrally located. Yes! Stay! We camped at Wild Cherry Resort in a Fifth Wheel. Eat at French Valley Winery on the lake...with outdoor eating areas, stunning views of beach and lake, and outside wine tasting. North of town. Get their yummy pizza and cheese plate...buy a botttle of wine and talk about, "love, passions and dreams"! There's lots to do nearby and all that is easy to get to. There is a driving range and a pond. We didn't use the party room but it looked nice. If the cherry orchard has ripe cherries you can get permission to pick your own. We camped at Wild Cherry Resort in a Travel Trailer. Bohemian Road Beach is our favorite, about 20 minutes away. We just loved this campground! We will definitely be back again! It is just beautiful and the owners are very attentive. We had a nice campsite around the pond. Very few trees, but the grounds are so well kept on a regular basis and the grassy areas are abundant and well maintained, too. 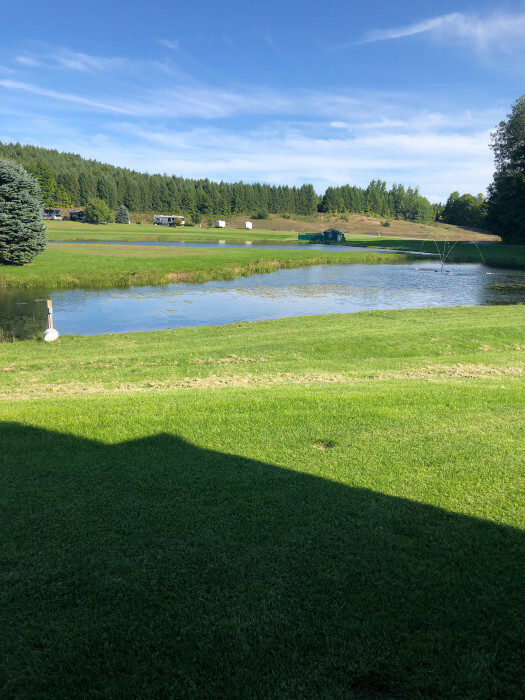 It was quiet, (only heard bullfrogs from the pond at night) and we did not see any restroom facilities (although we did have full hookups and did not need any facilities). If you enjoy peace and quiet and the view of ponds and orchards, this spot will definitely NOT disappoint! Loved it! We were in a small Sprinter motorhome with a tow vehicle. We were happy to have free wi fi also! Every morning, your trash is picked up at your campsite and a paper is delivered. What a nice way to start out your day!! Everyone there was super helpful and made sure that our stay would be nice. Worth every penny! I can't remember exactly how much it cost. Our site was large and one could either back in or drive in forward, depending on where you wanted to have your coach door facing. For a golfer, there is even a driving range on the property!! I noticed an area up by the clubhouse where there were RV spaces used for seasonal folks. This area is also nicely appointed and well kept. This park does seem like a "big rig" friendly resort. We not spot any tents, but saw some tent sites. We camped at Wild Cherry Resort in a Motorhome. Suttons Bay has a nice marina and a good "walking" (biking too) trail that goes all the way to Traverse City. Close to Leland and Northport, too. Traverse City has every service and activity one would need. Camped in a 35 foot 5th wheel on back-in site 62, which is sand. Easy access & required one board to level side to side. Long site with plenty of room for truck. Large concrete patio. Lots of grass between neighboring sites & backed to grass reaching to pond. No shade. There is no shower or laundry house. There is a clean laundromat three miles away in Sutton's Bay. Good WiFi & antenna TV. Exchange book collection. Very quiet at night except for low hum from pond air bubbler, which might not be heard if at another site. Location is lovely, surrounded by woods, while sites are open. Would rate this park much higher if there were showers & laundry facilities. We camped at Wild Cherry Resort in a Fifth Wheel. We recently bought our new-to-us 37' RV and wanted to try it out for a few nights. We live in the area and chose Wild Cherry Resort because of its lovely landscaping and peaceful atmosphere. Office staff were so pleasant, put us in a prime spot on the end of a row by the pond. Pond was clean (they have a little cleaning robot in it that keeps it from getting scummy) with cattails and wild birds. At night the frogs sang us to sleep. Park is extremely quiet, which we appreciate, and staff is working all day, every day to keep it lovely. We were in a 50 amp full hookup space, everything worked perfectly. Trash is picked up at daily at your site. Parking site was gravel with a concrete patio and picnic table. Very little leveling needed. We brought our two dogs, one of whom is 80# and over the stated weight limit. The park is flexible on that restriction, just ask. Lots of areas to walk your dog, including orchards and woods. They just ask that you not let your dog do their business on the beautifully maintained lawns around the sites, and I can understand that. The only reason that I give this park 9 stars instead of ten is that there are no bathrooms or laundry. For a self-contained rig, this is not a problem, but for the tent and yurt campers (they have a yurt here!) it might be less than desirable. The park has several driving range/putting greens but no playground. Kids were safely riding their bikes on the paved roads within the resort, though. Personally, we greatly enjoyed the quiet. Several wineries right next door, with quaint towns, beaches and more wineries within easy driving distance. Yes, the park is expensive, but rates are representative of the area. We would stay here again, and recommend it to others. We camped at Wild Cherry Resort in a Motorhome. 45 North winery is right down the road, and has a very nice tasting room. Aurora Cellars is also very close, and other cideries/wineries are minutes away. Small town of Lake Leelanau nearby with cafes and necessities, as well as a wonderful bakery. Suttons Bay has even more great spots to eat and shop. Park is centrally located to get to all areas of beautiful Leelanau County. Park sites are large. Really not pet friendly even though they claim to be. Owner makes you take your dog to a specified area to do it's business. He had a fit, ours urinated on the grass in the campsite. Nothing here for kids to do, it was pretty boring for them. Expensive for what he offers, which is nothing but real bad WiFi. We really liked the surrounding area, but would find another campground the next time. We camped at Wild Cherry Resort in a Fifth Wheel. We have camped here over the last 5 years, a few as seasonal. I'm not surprised seeing the latest negative reviews. We reserved a specific site with the owner early in the winter of 2012 for a agreed upon seasonal site. When we arrived for our summer stay we found our site was already taken by a motorhome. Making a long story short, we couldn't have the site we gave him a $1600.00 deposit on many months earlier, and he demanded we take a site that he knew we didn't want. As some others mentioned here, he was extremely rude and insulting. I asked for my deposit back (which he gave back) and drove 5 hours back home. Our summer plans were ruined. He keeps saying he's planning on improvements, he never makes any. No pool, no store, no bathrooms, Wi-Fi spotty, no cable TV, only a few channels can be received from Winegard antenna. The price he charges is way too high for the service he provides. The pond area is overgrown with scum and weeds, lots of mosquitoes and droppings from the many ducks and geese that run around it. He is trying to be like a couple of the higher class RV parks in the Traverse city area. He falls way short. We refuse to return to this campground, unless someone else buys him out. We camped at Wild Cherry Resort in a Fifth Wheel. We camped there last fall in our 21 ft Jayco fifth wheel. This year we were told that we were not welcome because our 5th wheel is to small. They now require at least a 27 ft camper, or a tent? Note: Last year, our camp site's power pole did not work and we had to borrow a long cord and pull power from a nearby site. Note 2: There are not bathrooms or shower house, and there wasn't enough water pressure on our site, to allow taking a good shower. Note 3: I picked up a virus on my computer, while using their unsecured wireless access! We camped at Wild Cherry Resort in a Fifth Wheel. The sites have nice concrete pads and a small patio, a newspaper is delivered each morning and trash collection is done at your site, but the "resort" lacks restrooms, showers, laundry, and a pool. It is very quiet, but lacks the amenities of a first class RV resort charging $59. Be careful when reserving a site if you want to have a campfire in the evening, many sites do not have fire circles. Wild Cherry is located in a centrally located area making it easy to visit various wineries, Suttons Bay, Leland and the rest of the beautiful Leelanau peninsula. 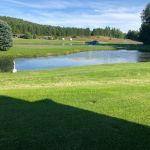 We camped at Wild Cherry Resort in a Travel Trailer. "Resort" is a joke! This place doesn't have a pool, bathhouses, laundry, cable TV, playground, camp store or any other normal RV park amenity. The owners appear to be frustrated golfers - all focus is on building and/or maintaining several golf greens around the algae choked pond. The physical sites are beautiful but the price is ridiculous for what is provided. We camped at Wild Cherry Resort in a Fifth Wheel. Not pet friendly. Made us leave because our dog pottied on site. We cleaned too. Owner does not allow anything to sit on grass/weeds. Owner has a short temper. Very mean and rude to us. We have camped in 10 different states and have never felt so disrespected. I have never been kicked out of an establishment. I left in tears. We camped at Wild Cherry Resort in a Motorhome. Spacious, scenic park. But overpriced, should be $10/night less since it needs more amenities. Has no pool, no cable TV, and no restrooms or showers yet. Extremely quiet and lots of places to walk your pets. Liked the large sites. Might stay again if it is "right-priced." We camped at Wild Cherry Resort in a Fifth Wheel. There are some wonderful winery tours around this location and the town of Suttons Bay is very close. There are restaurants and stores in Suttons Bay. Traverse City is only about 25 minutes away. The Aurora winery is about one mile away. They have a wonderful Wed. evening offering of wine, fire grilled pizza and live music each week during the summer. There are MANY wineries within about a 10 mile radius. All are great to visit (esp loved Black Star Farms) Suttons Bay has a nice marina and a good "walking" (biking too) trail that goes all the way to Traverse City. Close to Leland and Northport, too. Traverse City has every service and activity one would need. Are you affiliated with Wild Cherry Resort ?